“Inhumane treatment of animals is a concern of Florida citizens. The people of the State of Florida hereby limit the cruel and inhumane confinement of pigs during pregnancy as provided herein. – Constitution of the State of Florida, Article X, Section 21. In November 2002, over 2 ½ million Floridians voted to prohibit the cruel confinement of pregnant pigs in factory farms. It was the first time that a farming practice had been banned because of its inherent cruelty in the United States. After a six year phase-out period, this initiative took effect on November 5, 2008. Before the vote, Florida’s legislature had ignored proposed legislation to ban the gestation crate, one of factory farming’s worst forms of intensive confinement. Animal advocates took matters into their own hands. Hundreds of volunteers gathered over 600,000 signatures from registered voters to qualify for the ballot. Motherhood behind bars. Pigs in industrial farms live in barren, overcrowded pens. 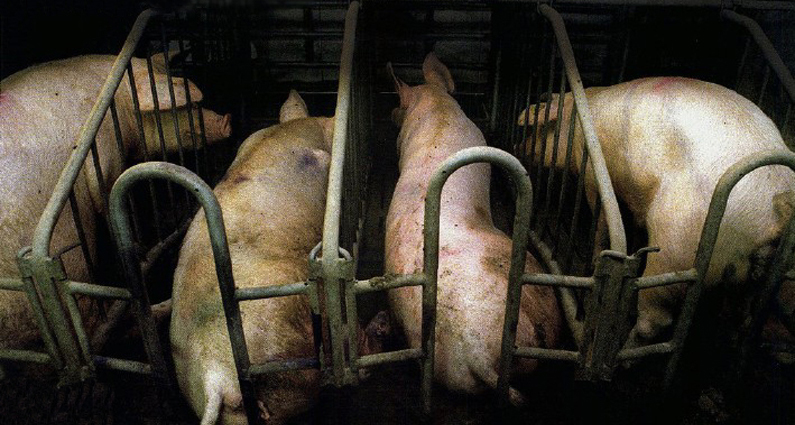 Female pigs spend their entire lives confined in narrow metal enclosures. The “gestation crate” is where the pig lives while she is pregnant. The crate is so small, just two feet wide, the pig can’t even turn around or lie down comfortably. Shortly after giving birth, her piglets are taken away and she is re-impregnated to start the cycle all over again. After four or five years, she will be sent to slaughter. Factory farming and the environment. Factory farms not only abuse animals, they are notoriously bad for the environment. Typical pig farms use an astounding amount of water and produce tons of manure every day. Too often, waste from pig farms leaks into rivers and streams, killing fish and contaminating drinking water. Pig farms also foul the air. Defending the ban. Ever since the landmark 2002 vote, politicians and business groups have criticized the “pregnant pigs” amendment, denigrated the suffering of pigs on factory farms, and threatened to weaken or repeal the amendment. These efforts not only ignore the will of a majority of Florida voters, but are an insult to the thousands of Floridians who collected signatures, raised funds and in other ways worked hard to get this initiative on the ballot. In Florida, citizens enjoy the right to amend the state constitution by introducing ballot initiatives. The initiative process was set up to allow citizens to band together and make direct change if their elected representatives refuse to do so. Unlike other states, Florida does not allow citizens to propose and approve state laws (statutory initiatives). What has been the effect of the 2002 vote to prohibit gestation crates? Shortly after the vote, two large pig farms in Florida chose to go out of business rather than provide pregnant pigs with enough room to turn around! The ban on gestation crates has worked to discourage the industrial farming of pigs in Florida, helping animals and protecting our environment. Unlike Florida, neighboring states Georgia and Alabama each have dozens of industrial pig farms (there are an estimated 250,000 pigs in factory farms in Georgia). The vote sent a powerful message to the pork industry, and motivated animal welfare advocates across the country. Since 2002, nine states– Arizona, California, Colorado, Maine, Massachusetts, Michigan, Ohio, Oregon, and Rhode Island– have followed Florida in banning gestation crates. Does this mean that pork can be “humane”? The switch from gestation crates to group housing, where female pigs can stretch their legs and socialize is a significant welfare improvement. But even without gestation crates, modern pig farms remain bleak places where pigs may never breathe fresh air, feel sunlight or step foot in the outdoors. Pigs are intelligent, active and sensitive animals. The best way to help the more than 100 million pigs who are raised and slaughtered in the U.S. every year is to become vegan or vegetarian.